Much of Siberia is sheathed in sub-artic grasslands, conifer forests and peat bogs today, but 250 million years ago it was the site of a volcanic episode of Armageddon-like proportions- great fissures developed in the earth’s crust and, over the course of a few million years, belched out one to four million cubic kilometers of blazing-hot basaltic lava. This eruptive event, among the largest in earth history, is thought to have triggered the Permian extinction. The end Permian extinction, which eradicated over 90% of our planet’s plant and animal diversity within a relatively brief stratigraphic time window, was an extermination event of truly unimaginable magnitude. It has been referred to as “the Great Dying”, “The Mother of All Mass Extinctions” and “Life’s Greatest Challenge”. These apocalyptic titles are not without warrant and it can safely be said that the Permian-Triassic mass extinction represents the worst biotic crisis to hit the earth in the last 550 million years. What was life like during the Permian? Primitive therapsids, the remote forerunners of modern-day mammals, were the dominant vertebrates on land at this time – ranging from huge sabre-toothed Gorgonopsids to beaked, plant-eating dicynodonts to terrier sized Therocephalians. The reptiles from this period include giant, stout-bodied herbivorous pareiasaurs and lizard-like millerettids. The Permian period saw the development of terrestrial food webs of unprecedented complexity. Keep in mind, in all of this, that the Permian began and ended well before the first dinosaurs evolved. I hope my readers will forgive the stark brevity of my descriptions here, for I intend to cover many of the faunal groups listed above in significant detail in future posts. What changed at the end of the permian? For starters, the vast reefs – burgeoning with all manner of marine life for millions of years – vanished at the end of the Permian. The end Permian event is followed by a 7 to 8million year long “reef gap” in the fossil record. The two dominant forms of coral at the time – the tabulate and rugose corals – were wiped out entirely by the event (stony corals are the primary reef builders in modern-day oceans). Bivalves and Brachiopods are shelled marine animals with an evolutionary history that spans over 500 million years. They suffered heavy losses during the end Permian extinction, but managed to survive, recover and thrive into the present day. Mussels and clams are examples of bivalves – their soft bodies are enclosed in a pair of similar-looking shells called “valves” that are joined by a ligamentous hinge. Brachiopods, informally known as “lampshells”, bear two shells of unequal size and are similar in appearance to early Roman oil lamps. Some of the external differences between the two groups can be discerned in the image below. Bivalves are mollusks while the brachiopods constitute a phylum unto themselves – the rather astonishing phylogenetic implication of this statement is that Bivalves are actually more closely related to snails and squid than they are to the much more similar-looking brachiopods. Brachiopods were more abundant and diverse than Bivalves in the seas of the late Permian, but the situation was reversed permanently after the extinction event: the number of currently-existing Bivalve genera exceeds the number of living Brachiopod genera by a factor of nearly 10. Many reasons have been cited for the apparent competitive triumph of Bivalves over Brachiopods, including the greater range of habitats and niches that Bivalves are capable of successfully occupying and the generally higher metabolic rates they display. In all likelihood however, despite their external morphological similarities, the two groups may fill niches so radically different that direct competition between them was never an issue. They may have been, as two workers so keenly put it, “ships that passed in the night”. The line of symmetry in a Brachiopod lies between the two sides of a single valve. The line of symmetry in Bivalves lies between the two valves. Ammonites – tentacled free-swimming mollusks with coiled shells – were hard hit by the event, with 97% of known genera going extinct. But, like the Bivalves, they managed to recover and flourish in the following “Age of Reptiles”. They were ultimately done in by the K-T extinction event over 180 million years later. Fixed, plant-like echinoderms (like sea-lilies and blastoids) accumulated in such numbers during the Permian that they essentially formed forests that carpeted the sea floor. These sessile animals were decimated by the Permian extinction and the “echinoderm forests” they formed were never reconstructed in any succeeding geologic period. The holocaust was not restricted to large multicellular organisms: single celled planktonic organisms like radiolarians and foraminiferans took a severe beating as well. Radiolarians are microscopic floating creatures that construct elaborate skeletons of silica. When they expire, their skeletons sink and accumulate on the sea floor. Oozy accretions of radiolarian skeletons are transformed by a process of compaction and hardening, over a time span of millions of years, into chert, a fine-grained silica rich rock. There is a conspicuous absence of radiolarian cherts in the fossil record for an 8 million year period following the end-Permian event, indicating some kind of catastrophic radiolarian die-off. So, in summary, from mollusks to oceanic microbiota, the Permian extinction wreaked havoc on marine life of all sizes and shapes. On land, the situation was similarly grim. Huge numbers of plant and insect taxa fell. Roughly 2/3rds of all terrestrial vertebrate families vanished. Among the most incredible aspects of the end Permian saga on land, was the post-disaster ascendancy of a humble herbivore called Lystrosaurus to a level of global ecological predominance that has never been achieved by any other individual vertebrate genus (or family, really) in all of earth history. Lystrosaurus was a pig-sized therapsid – a scaly ancient relative of modern-day mammals. It was a beaked herbivore with two tusk-like canines and short, stout semi-sprawling limbs. Given the apparent paucity of big predators (and major herbivorous competitors, for that matter) in the post-Permian landscape, Lystrosaurus enjoyed free rein to multiply and diversify on an astonishing scale. 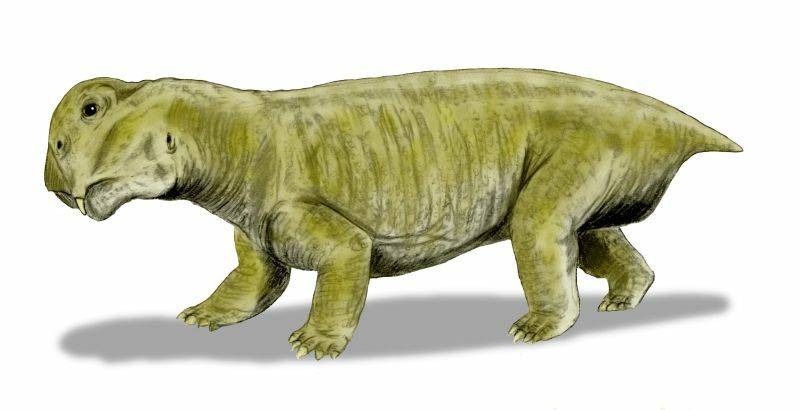 Lystrosaurus remains make up over 95% of many vertebrate assemblages from the early Triassic (the period following the Permian). “In South Africa” natural historian Michael J Benton writes, “paleontologists cry with frustration when they find another Lystrosaurus skull”. Puzzlingly, however, it has no obvious features that mark it out as an animal built to survive extreme environmental conditions. Their possibly semi-aquatic mode of life, their much vaunted lack of ecological specialization and pure luck have all been put forward as possible explanations for their spectacular, albeit short lived, success. What caused the Permian extinction? Was it the result of a meteorite impact? The causal mechanisms that drove so many varied forms to extinction have been speculated over for decades – historically, a wide range of phenomena have been called upon to account for the devastation, from trace element poisoning in the world’s oceans to elevated levels of cosmic radiation. A cataclysmic meteorite impact – like the one that brought the reign of the Dinosaurs to an ignominious conclusion – would have left behind a signature of iridium and shocked quartz in the rock layers. Iridium is practically non-existent in the earth’s crust (less than 0.001 parts per million) but relatively common in meteorites. Significant quantities of it are found in the clays of the ‘Cretaceous-Tertiary boundary’ – the point in the fossil record beyond which the dinosaurs disappear. This iridium is thought to be of meteoritic origin. Quartz grains with clear signs of deformation by hypervelocity shock are also found at the boundary – the products of a violent collision. These and other pieces of evidence allow us to say, with some certitude, that the non-avian dinosaurs were done in by a space rock. Does the evidence stack up in strong favor of a meteorite impact at the Permian-Triassic boundary? In a word, no. The evidence for a late Permian impact event is limited and hotly contested. For example, cage-shaped carbon molecules called fullerenes containing noble gases (argon and helium) with isotopic ratios that reflect an extraterrestrial origin were discovered at the Permian-Triassic boundary by a group of University of Washington researchers in 2001 – but their results were not successfully replicated when another team from Caltech analysed PT-boundary material from the same test areas. Published evidence of unusually high iridium levels and shocked quartz from an impact event at the PT boundary has been met with considerable skepticism from many in the scientific community. The most popular extinction model points to an episode of intense volcanism, 250 million years ago in what is now Siberia, as the likely triggering mechanism. The Siberian traps – a large expanse of volcanic rock in Asian Russia stretching across 2 million square kilometers – were formed by this eruptive event. The eruptive style is worth comment: instead of viscous lava pouring out of classically conical volcanoes, one must imagine highly fluid lava issuing from huge fractures in the earths crust and flowing out over thousands of kilometers. Successive lava flows built up an immense layered plateau of basalt (basalt is essentially solidified lava). The threat that this event posed to life did not lie so much in the incessant outpouring of hot, fast-moving lava (which surely annihilated life within a regional radius) as in the outgassing of prodigious quantities of carbon dioxide and sulphur dioxide. There is good evidence to show that global temperatures rose considerably at the end of the Permian – and elevated atmospheric levels of heat-trapping greenhouse gases like carbon dioxide and methane most likely accounts for this change. The release of carbon dioxide by the Siberian traps event could have driven global temperatures up enough for another serious greenhouse gas source to come into play: gas hydrates. Gas hydrates are crystalline solids in which gases are locked up in “cages” made of hydrogen-bonded water molecules. Carbon dioxide and methane containing gas hydrates may be found at great depths in sediments around the rims of continents and in permafrost. It is thought that gas hydrates today contain trillions of tonnes of stored carbon, much more carbon than can be found in the combined fossil fuel reserves of all of the nations on earth. The mass melting of frozen gas hydrates would have injected tremendous amounts of methane and carbon dioxide into the atmosphere. The high temperatures would have also decreased the solubility of oxygen in water, leaving the world’s oceans relatively oxygen depleted. Anoxia – or oxygen deficiency – might have been the axe by which the Permian extinction cut down so many diverse families of marine life, particularly those reliant on the construction of calcium carbonate shells. Several lines of evidence point to widespread anoxia in the seas of that time – the presence of black mudstone, for example, in the layers that follow the PT boundary is a telltale sign of low oxygen concentrations. Anoxic conditions permitted the rapid proliferation of oxygen-hating sulfate-reducing bacteria that, in the presence of light, produce hydrogen sulfide – a gas that is toxic to most life forms and harmful to the ozone layer to boot. Carbon dioxide is heavier than air and, even above water, can drive down oxygen levels by a process of simple displacement. Carbon dioxide is poisonous in high enough concentrations. Sulfur dioxide, another major gaseous product of volcanic activity, is a precursor to acid rain. Acid rain would have wreaked havoc on terrestrial plant and animal life and introduced cocktails of acids into enclosed bodies of water. The sulfate aerosols that result from the interaction of sulphur dioxide with the earth’s atmosphere are actually capable of reflecting and scattering light from the sun. They may have induced a brief initial period of global cooling before the pronounced warming trend set in. 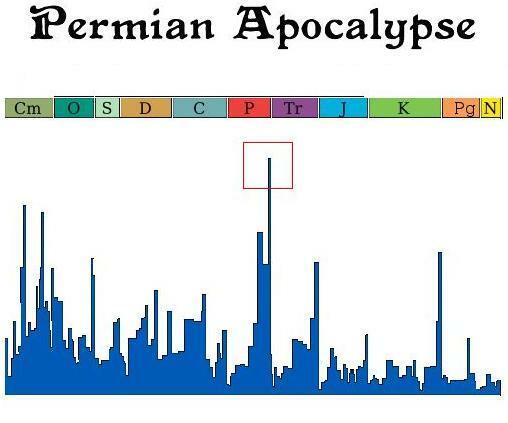 Hydrogen sulfide emissions, the spread of toxic ash, global warming, wild fires, acid rain, planet-wide anoxia and a weakening ozone layer are all phenomena that have been implicated, with good reason, in the Great Dying of the end Permian. There can be no doubt that this was an apocalypse, but it was not a simple apocalypse. It involved a complicated chain of events and employed multiple agents of death. 2. Donovan, Stephen K., and S. K. Donovan, eds. Mass extinctions: processes and evidence. London: Belhaven Press, 1989. 3. Ward, Peter D. Under a green sky: global warming, the mass extinctions of the past, and what they can tell us about our future. HarperCollins, 2007. 4. Benton, Michael J., and M. J. Benton. When life nearly died: the greatest mass extinction of all time. Vol. 5. London: Thames & Hudson, 2003.